Mark’s Custom Exteriors of Saint Helens, Oregon, has received the most prestigious contractor award GAF offers: The GAF President’s Club Award. This highly coveted award recognizes Mark’s Custom Exteriors as one of the “elite of the elite” residential roofing contractors in the United States. GAF is North America’s largest roofing manufacturer, and only GAF Master Elite® Contractors can compete for its residential President’s Club Award. To qualify for this award, a residential roofing contractor must meet specific criteria in at least one out of three different pathways: the Performance pathway, where contractors focus on giving their property owners the best possible service, quality, and protection; the Reliability pathway, where the contractor has a long history of offering their customers the best quality and protection; and the Service pathway, where contractors consistently offer their customers the best protection available in the marketplace. 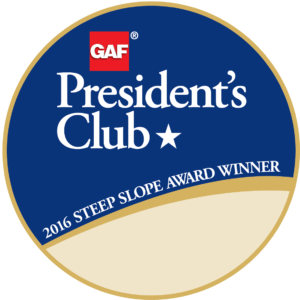 Mark’s Custom Exteriors has been a GAF Master Elite® Contractor since 2011; the company received the President’s Club Award due to its excellent performance in 2016. To become a Master Elite® Contractor—a status that less than 2% of roofing contractors nationwide are able to achieve—a candidate must demonstrate proper licensing, maintain insurance (in states that require it), have a proven reputation, and show commitment to ongoing professional training. “There’s quite a lot of interaction with our customers,” continues Holcomb. “We always have a site foreman at every project, at all times. The foreman keeps the customer informed and ‘in the loop’ about what’s being done and what still remains to be done. 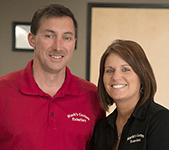 People appreciate that.” The attention to customers is reflected in the company’s ratings and reviews; Mark’s Custom Exteriors is an A-rated provider on Angie’s List and holds an A+ accreditation with the Better Business Bureau. In 2015, Mark’s Custom Exteriors began partnering with No Roof Left Behind(TM), a nationwide program in which members of a community nominate a neighbor who has fallen on hard times. That neighbor then becomes the recipient of a new roof, free of charge and installed by the local contractor. “This is one of the newest things we’ve taken on, and we’re really excited about being involved with this project,” says Holcomb. The company also works with Habitat for Humanity and is a Certified Green Roofer(TM).